Everett is having the worst day. She was late for work and got a warning, burnt her finger while making coffee at work, thinks she’s going to fail her statistics class at school, is barely making ends meet paying bills, and now her car breaks down. Evy barely makes it into the mechanics and has to leave the car overnight and her boyfriend isn’t picking up the phone. After the hunky mechanic Draven “Dray” gives her a lift to her apartment, her world falls further apart. She walks in on her boyfriend in the act of cheating. Her world crumbling, Dray steps in to help her, but this damsel in distress is not as weak as she might appear to be. Dray was not always a valiant gentleman who feels compelled to help any less fortunate damsel he meets. He has his own sordid past. This is a relationship built on the healing powers of romance. 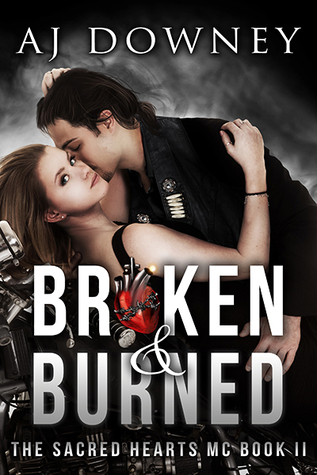 Broken and Burned, The second book in the Sacred Hearts MC Series was quite different from the first book (Shattered and Scarred). Though AJ Downey used another character from the MC, the story was wildly different. I thought it was quite clever for Downey to utilize characters from the first book that she had already given such personalities in Shattered and Scarred. I love the fact that this second story has such a great connection to book one, while being its own great story and potentially a standalone read. It’s as if, by telling the stories of Ethan “Trigger” in book one and the gal he finds on the side of the road and Draven “Dray” in book two and the gal he finds broken down at his mechanic shop, that Downey is creating the world of the MC. Eventually we will get everyone’s stories and pull more characters into the MC’s world. Downey’s characters are so full of life and alive. Each character has a very specific backstory and such detailed characteristics and details that the characters must be alive, they seem so real. Both Dray and Evy are intensely and intimately real to me and I love them. They are unique and have their own interesting personality quirks. I feel like I would know how each would think and act in situations. I also know, without a doubt, what each one looks like. I would like to mention how fantastic Downey’s character names are. Everett: named for the place she was born and the confusion in her father’s mind. Draven: carries his mother’s last name as his first name. How neat are those names and the stories that go along with them? Again, like book one, Downey utilizes POV switching between Dray and Evy seamlessly to tell their combined story and their personal stories. This novel was published by Second Circle Press on September 8th, 2014 and is available on Amazon here.